I am well aware, Dear Reader, that I had promised that this installment would be the last in this series. However, while writing this post I realized that it would take yet one more installment for me to complete Marta's saga. I appreciate your forbearance. One evening during my parents' out-of-town trip, Marta announced at the dinner table that she and Big Daddy were going to take me and my siblings and Telma to the beach the next morning. We were going to leave at dawn and drive to Rehoboth Beach, Delaware, where we would spend the day taking in the pleasures of the beach and boardwalk. Furthermore, we had a perfectly nice country house in rural Maryland that we went to on most weekends, so why go to the beach in Delaware? 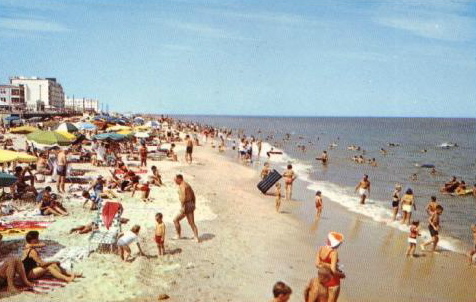 According to MD, "our kind" didn't go to Rehoboth Beach, as it was all rather honky-tonk, what with its cheap cotton-candy-and-salt-water-taffy boardwalk culture and throngs of sunburnt mid-Atlantic sorts who didn't know any better than to enjoy themselves there. 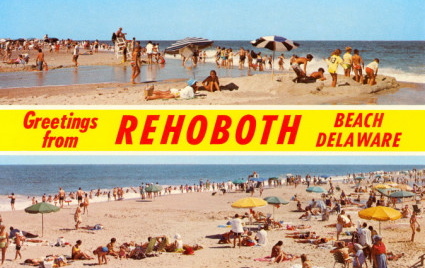 Needless to say, the prospect of our spending a day at Rehoboth Beach was terribly exciting, if not thrilling! Marta told us that we could only go to Rehoboth on two conditions: the first was that we must never, ever tell our parents about Big Daddy's moving in with us, and the second was that we must keep secret our trip to the shore. With that agreed upon, we all got up early the next morning and piled into Big Daddy's limousine. My sister, brother, and I sat in the back, along with Telma. Big Daddy and Marta rode up front. A one-day round trip to Rehoboth Beach from the Cleveland Park neighborhood in Washington is a considerable undertaking, under any circumstances. Today it takes about three hours to make the 125-mile one-way trip. In the early 1960s, when we made the journey, it easily took four or more hours to drive each way, particularly on a busy summer weekend. 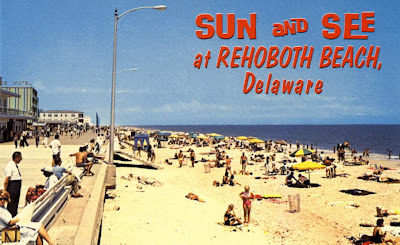 Our brief visit to Rehoboth Beach was a blur of sun, boardwalk rides, fried seafood, and saltwater taffy, sandwiched between the long car rides to and fro in Big Daddy's limousine. On the journey home, all of us stuffed and sleepy, Marta reminded us of our pact. We three Darlings promised, again, that we would never, ever tell. My parents returned to find the house as they left it, with all its occupants in their proper places and Big Daddy nowhere to be seen. Several days later, though, MD found out that all was not as it seemed. She overheard a conversation among Hermione and me and our little neighborhood friend Antonia de Peyster, in which we talked about going to Rehoboth Beach and how much fun we had there. MD summoned Hermione and me in front of her. "What's this I hear about your going to Rehoboth Beach?" "Come on now, you two, tell me! When did you go there? Who took you there?" With the jig up, Hermione and I sang like jailbirds. The whole story came tumbling out that we and Frecky had gone to Rehoboth Beach with Marta, Telma, and Big Daddy in the Ecuadorean Embassy's limousine. MD further extracted that Big Daddy had moved into our house while she and my father were away, and that Big Daddy and Marta and Telma had made themselves comfortable upstairs for the duration of my parents' trip, with Telma sleeping in my sister Camilla's bed, and Big Daddy and Marta sleeping downstairs, in Marta's room. Hermione and I were beside ourselves. We had betrayed Marta, and had gone back on our word to her that we would never tell MD what had happened while she and our father were away. I had grown very fond of Marta and Telma while they lived with us, and the fact that they were being sent away because of our stupid blunder was extremely upsetting to me, and I bawled like the little boy that I was. Marta and Telma moved out that very afternoon, driven away in Big Daddy's car, never to be seen or heard from again. One year later MD received a telephone call from an officer at the Department of Immigration and Naturalization with a request for an interview about a woman named Marta, who had once been employed in our household. Marta had apparently got herself into very big trouble. And a whole lot more trouble than any of us could possibly have imagined. * Reggie understands that MD may well have been entirely wrong in her disapproval of Rehoboth Beach. As he has written before, MD could be a terrible snob, and she had very strong opinions (not always entirely well informed) on almost everything. Reggie spent several weekends at Rehoboth in his twenties, where he enjoyed himself immensely, and he understands that the seaside resort has been much improved since then. ** To the best of his knowledge, this was the only time in Reggie's life that he ever consciously littered, a practice of which he highly disapproves. *** MD said years later that she had felt sorry for Marta and Telma, and that she gave Marta three months wages in cash, even though she felt she was under no obligation to give her anything, considering the circumstances. JCW, how right you are -- on all counts! Parents are the worst people to lie to--it virtually cannot be done, thus exposing yet another of Marta's lacks of judgment. Beach resorts do seem to have their ups and downs. In Cleveland, the nicest public beach was always Mentor Headlands, a little ways out. Of course, today they announce "bacteria counts" for beaches, a notion so unpleasant that one might opt for a hike in the park instead. Reggie has never been very good at lying. He finds the truth much easier to remember! Bacteria count? Blech! We have been so entertained by this wonderful description of a day out to Rehoboth Beach and, of course, the consequences which were to follow. We are able to picture exactly the scene, the kind of place and why your mother would so disapprove. The exact meaning of 'honky-tonk' is unknown to us, never having heard the expression, but it does, we feel, sum up all the ghastliness, which children so delight in, very well indeed. I promise it is the last in the series! I have been gripped by this since the beginning! I'm very much looking forward to the final post. And I was glad to hear you disapprove of littering. I had nothing but sympathy for Marta up until that point. (Weirdly, even despite the shoplifting!) But I'm afraid I just can't forgive such wanton disregard for the countryside. Thank you. Littering is completely unacceptable, in my view! If MD thought Rehoboth was honky-tonk, she'd have died if she ever saw Ocean City, MD. Great story. Can't wait for the denoument! I can only imagine the feeling of violation upon learning that one's personal spaces and bed had been used by a stranger of sorts. I would be very upset at that. I have always been fond of Rehoboth and consider it superior to certain Virginia beaches, a fact that I have still not convinced my husband to even consider. It is for all of those honky-tonk down market characteristics that so delightfully characterize Rehoboth, that I take LFG there at least once every summer. She needs it--to balance the fact that she took her first ever steps as a toddler, on Nantucket. And to this day, she believes that the Sherry Netherland's horse and carriage was procured, when she was three years old, just for her. Now don't leave us hangin' for another week. One, indeed, requires contrast to appreciate what makes such places special! I will be more hasty with my next posting, I assure you. I am jealous! I was not allowed to attend Beach Week or whatever it was called back in 1963. My only experience of Delaware beaches has been over Columbus Day weekend at Dewey Beach. There is a huge Greyhound event then that is absolutely splendid. It looks as if several thousand space aliens have taken over and they are all hounds! Reggie, somehow the thought of you throwing trash out the window was unimaginable given your erudite upbringing and your highly refined sensibilities. Then again, it reminded me of a time past when this act was more commonplace. My how some things do in fact change for the better. I am loving this story and hope you have more in that steel trap mind of yours to keep us coming back to share your memories and adventures. I so wish you had a picture of Marta and Big Daddy to post, but I can well imagine. If I may venture a definition of honky tonk. well honky has to do with geese --tonk was a piano company enuf said. I would have to agree with MD - Rehoboth is dreadful. I am enjoying this family story and will now be looking forward to the grande finale. I think that my sympathies are with your Mother and I would have sent Martha packing as well especially as she had cajoled you children into assisting in her deception! I do like the fact that despite everything your mother made sure that Marta was paid three months wages. That says a lot about her. Like Jane and Lance, I also do not know the meaning of 'honky tonk' but your description makes it easy to picture what such a word encompasses. PS, see below for the ultimate and most-amusing definition of "honky-tonk!" So when are you going to give up your day job and become a full time author? I would buy all of your books and have the librarians I know buy them for their libraries. You would be a best seller in no time! It seems all Eastern Seaboard, beachie, shore-line, boardwalk venues can lean towards the cheesy, kitschy and tacky. We have visited Rehoboth several times, first braving the journey across the Bay Bridge, then staying with friends in the most lovely neighborhood of Henlopen Acres. Nothing cheesy here and only a bike's ride away from the beach. I first heard the term 'honky-tonk' many years ago when my grandmother made a disdainful reference to Daytona Beach. There's obviously something about that term that gives wee lads visions of delicious adventure. Well now....you've managed to spoil us all. Surely, you don't think for one minute that we'll be satisfied with the final installment of this little ditty, do you? I hope you have a whole treasure trove of family stories you can recall and present to us in tortuous installments, if need be. As previously suggested, have you given serious thought to becoming an author of personal adventures and stories? You already have written a vast collection that could result in a charming book. Your writing is so visually descriptive and wonderfully entertaining. 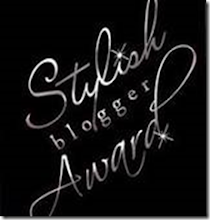 Thank you for delighting your readers! Reggie, you are the world's best storyteller! I laughed outloud when I read the part about how thrilled you were to be going to the saltwater taffy boardwalk and beach AND about you being a joyous litterbug. I can't wait for part four, but this is definitely my favorite of the series. I can see a sweet, but naughty, little boy enjoying himself immensely. I can't wait to hear how it all ends. Once again, you've kept us riveted! I agree more Darling family stoires ...did you ever go to Neverland Reggie? I thought you would get my Peter Pan reference,..
they were called Darling werent they? Well, for the first (and quite probably the last) time, my good guess is that, between Reggie and all his other readers, I'm by FAR the most qualified to answer what seems to be The Question of T he Day: "What does 'honkytonk' mean?". In explanation of my undeniable expertise, I should emphasize that all members of both sides of my family have been born and raised, since the 18th century, in the same, small, northeastern, Tennessee mountain county....so, I know whereof I speak. And now I'm a Honky Tonk girl. I am a bit surprised that so many of your British readers are completely unfamiliar with the term "honkytonk". What in the world did they think Mick Jagger was singing about? Of course (and I kid you not), when I was a very young and animal-obsessed child, my favorite Anglican hymns, which Ialways LOVED in church, were "Oh, Thou Kingly Turtle" and "All Hail Thou, Holy Parakeet". It was a real let-down when, in my adolescence, I realized the title was "Oh, Thou King Eternal" and first came across the word "paraclete". In any case, everyone should now have a fairly firm grasp of what "honkytonk" suggests and why the author's mother didn't approve of such for her children. I'm enjoying this story very much, Reggie. As I visualize it, it has all the elements of a pilot for a great TV drama series. I think we need to get Marta back for a full season! This is better than any TV! I have visited RB once so far in my life. As a youngster okay teen, I rode in the dark of night from the city of brotherly love to RB with my relatives to spend the night or was it weekend I do not recall. I ate Scrapple for the first time in a restaurant-- a short walk I think it was from the cottage. The most amazing thing -- I entered a tee shirt shop pondered the hundreds of iron on selections , once my decision was made, a red shirt with the white album image of John Lennon may he RIP, I turned to a young man working there to place my order --- I knew this guy !!!! David I said , OMG!!! !I am from Florida and worked with this fellow( in a bakery thru HS) and attended HS with his sister!!!! This here may be a big planet but it is a small small world after all. In conclusion, the 70s RB fuzzy but fond recollections. may others enjoy whatever it has to offer. P.S. I forgot to add that I thoroughly approve of your mother's good-sense (not to mention delicacy) in referring to RB as "honkytonk", rather than making direct reference to the actual people themselves...i.e. "low class", "trashy", etcetera. Most parents would, unfortunately, do the latter. When we were young, my two brothers and I were continually frustrated, on a regular basis when we wanted to go somewhere/place, and our mother told us no....inevitably and flatly saying "Well...they just DO things differently than we do. I don't think it'd be appropriate for us to go." (at which point, we always bristled and chafed at the "us"...as if we'd intended to take our MOTHER with us?). She never directly criticized any single person or group (not a bad habit to teach a group of rowdy boys), nor did she ever say (and this was particularly frustrating) whether the inappropriateness would lie in the place itself, the people, or us. Visiting was just....existentially "inappropriate"....end of story. My impression is that your mother, like mine (who arrives here this morning for a visit, while my French in-laws are already here for a 3 week visit) was intent on raising children who had, if nothing else, good manners which were equally directed towards everyone from the garbage-collector to the bishop. My mother was (is, perhaps; I wouldn't know, since I'm a bit past the schooling age) fond of paraphrasing Senator Langhorne by declaring "Etiquette is for people who don't already have manners". In any case, your mother sounds wise. Reggie Darling, I adore you! You are such a good writer. What really impresses me is that you can remember this stuff and pull it forth with some cohesion. One of my favorite movies of all time is "Secondhand Lions," because it reminds me of being a kid and feeling, as I observed adults (and the vast difference between things they say, and the things they do) that somehow I had been born into the wrong family at best, or at worst, been deposited on some kind of alien planet. If you haven't seen it, you would probably like it. Funny, and so much to relate to.